"In Fairbanks, Alaska, residents are using wood stoves to heat their homes during the frigid winter months. But, smoke created by these wood burners is contributing to some of the worst air pollution in the country." Sunday, March 3, 2013, 10 a.m.
Sunday, March 3, 2013, 11:30 a.m. to 1:00 p.m.
Is it an early spring? Come to this arboretum to study the trees in early leaf. Enjoy the views from the heights overlooking the Narrows. Dress warmly. 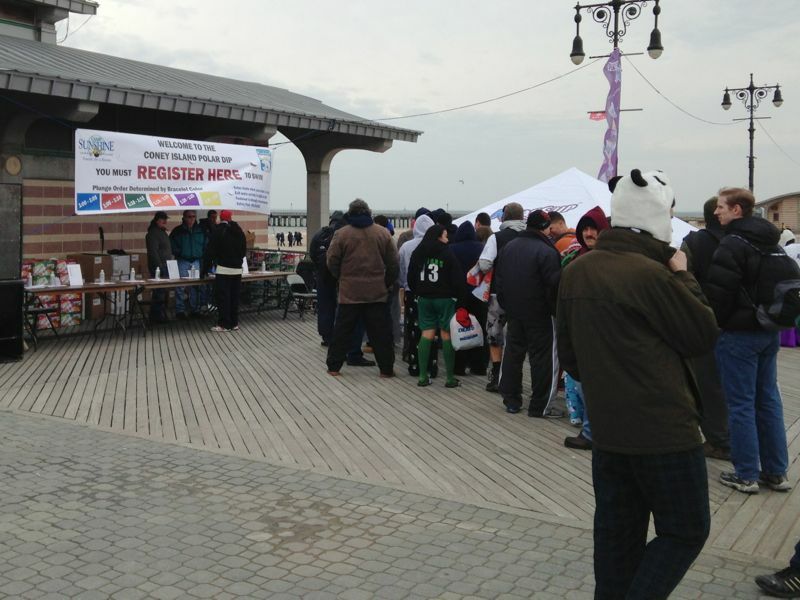 If it’s raining or snowing at the time of the walk, the event is postponed to Sunday, March 10, same time. Meet at the park entrance on Bay street between School Rd and North Rd. Contact Hillel Lofaso - hlofaso [AT] siprotectors.org for more information. Learn to identify and value the Flora and Fauna of Fort Tryon Park with author Leslie Day. Learn about New York's many birds and herbaceous plants with this expert naturalist. Greetings. This is the New York Rare Bird Alert for Friday, February 22nd, at 7:00pm. The highlights of this tape are GYRFALCON, ROSS'S GOOSE, BARNACLE GOOSE, BARROW'S GOLDENEYE, Eurasian form of GREEN-WINGED TEAL, BLACK-HEADED GULL and BLACKPOLL WARBLER, plus a pelagic trip announcement. For the third time in less than four years, a GYRFALCON has appeared briefly along the Jones Island strip. Following a bird at Jones Beach West End on 25 October 2009 and one along the Wantagh Parkway on 14 January 2012, there was a gray bird spotted late last Sunday morning along the eastern end of Ocean Parkway, near Oak Beach. The bird was relocated again briefly in the early afternoon, but has not been seen since. If in that area, keep your eyes peeled. Also at Oak Beach, a female BARROW'S GOLDENEYE was found late Saturday afternoon with Common Goldeneyes in the inlet, as viewed by the parking lot by the site of the former Oak Beach Inn. A RED-NECKED GREBE was in the Captree State Park Boat Basin on Monday, while a ROUGH-LEGGED HAWK and an AMERICAN BITTERN were among the birds at Gilgo on Tuesday. Twelve WHITE-WINGED CROSSBILLS were at Oak Beach on Thursday. At Jones Beach West End, the weekend's most unusual bird was a BLACKPOLL WARBLER feeding on the median lawn edge on Saturday. Also there that day were both RED CROSSBILLS and WHITE-WINGED CROSSBILLS, 21 AMERICAN OYSTERCATCHERS, and WHITE-CROWNED SPARROW. A LAPLAND LONGSPUR was still around the West End on Monday, this bird often visiting the lawn near the gazebo by the Coast Guard Station parking lot. A Eurasian form of GREEN-WINGED TEAL was noted with other Green-wings Thursday at Hempstead Lake State Park, on a pond next to parking lot 3. In Central Park, a subadult BLACK-HEADED GULL visited the Reservoir on Tuesday morning. An ICELAND GULL appeared on the Reservoir Tuesday afternoon, after continuing on the Lake at least till last Sunday. COMMON REDPOLL and BALTIMORE ORIOLE have also been seen around the Ramble feeders, and other redpolls have been noted, including at Jamaica Bay Wildlife Refuge. A BARNACLE GOOSE was still on Larchmont Reservoir, also known as Sheldrake Lake, off Weaver Street in Westchester County, at least to Tuesday. 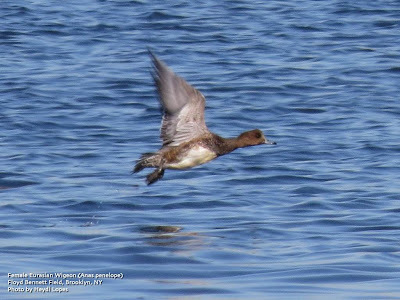 There were still at least five EURASIAN WIGEONS last Saturday, with a large flock of American Wigeons, on the West Sayville Golf Course, south of Montauk Highway. At Shinnecock Saturday, on the beach west of the inlet, were three ICELAND GULLS and white BONAPARTE'S GULL. Another ICELAND GULL was still at Iron Pier Beach in Northville Monday. On the sod fields between Doctor's Path and Route 105, just south of Sound Avenue in Riverhead last Saturday, the large Canada flock contained one ROSS'S GOOSE and one SNOW GOOSE, the ROSS'S presumably the bird often overnighting on Merritts Pond in Riverhead. Two ICELAND GULLS were still along the beach west of Montauk Harbor Inlet yesterday. See Life Paulagics is hosting a pelagic trip from Freeport aboard the Captain Lou Fleet's Starstream on Saturday, March 2nd. This 12-hour trip, leaving at 6:00 AM, costs $185 per person. For reservations, call Melissa Johnson of the Captain Lou Fleet at (516) 623-5823. Decent numbers of alcids have been further offshore, and it should hopefully be a good trip. 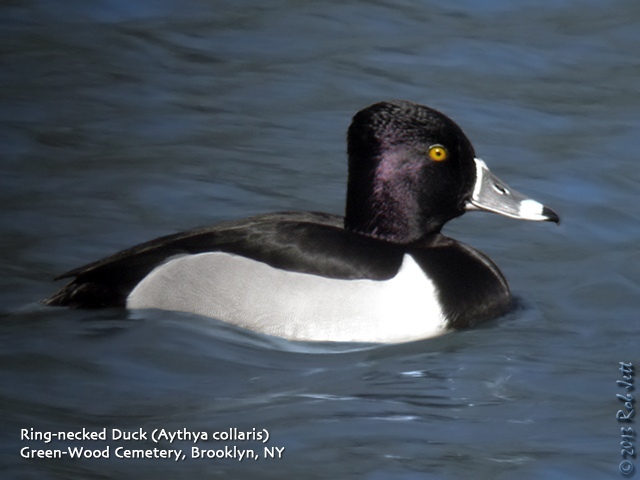 The Ring-necked Duck is an uncommon Winter visitor to Brooklyn. They breed in Northern New York State and are found, primarily, in fresh water. Despite their common name, the rarely seen "ring" around the neck is a purple sheen visible only when the male's neck is outstretched. Perhaps "Ring-billed Duck" would have been more appropriate. You can read more about their status in New York State here. Albatrosses aren't the world's largest birds, or the oldest -- parrots in captivity have lived to 80, Peterjohn said. But they are stunning, easily the largest sea bird, with wingspans as wide as 2.4 metres - "like a seagull on steroids," Peterjohn said - dwarfing the average grey gulls that roam beaches stealing french fries. Albatrosses mate for life, suggesting that Wisdom probably had to find a new, younger mate maybe twice down the line. They work at a relationship: "They dance together," said Chandler Robbins, a retired senior scientist at USGS. The birds face each other - eye to eye, beak to beak - and do a two-step, up and down, stretching their wings and craning their necks. Saturday, February 23, 9 a.m.
New York City Audubon and the Prospect Park Audubon Center present an exciting opportunity for bird-watchers and nature lovers of all skill levels. Join David Lindo (better known as “The Urban Birder”) for a two-hour walk to some of the best bird watching spots in Prospect Park. Meet at the Eastern Parkway BBG entrance 10 am. 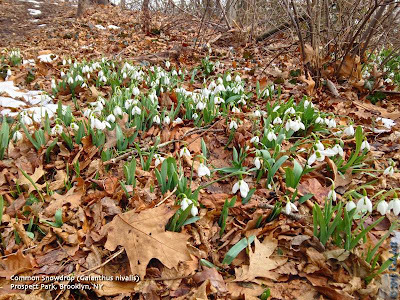 Note: Brooklyn Botanic Garden is free during winter weekends; this walk should continue after lunch at the café if optional, to Prospect Park. Saturday, February 23, 12 noon to 2:00 p.m.
Sandy altered the topography of Great Kills park. Rising tides breached the dunes and crossed the spit of land connecting Crooke’s Point with the mainland. We will walk the interpretive trails through the grasslands to look for evidence of winter wildlife and birds as we survey the changing environment of the area. Meet in the first beach-side parking lot approximately ¼ mile within the park. Weeds and garden herbs look different in winter mode. Join herbalist Gert Coleman as she share tips to identifying wintering plants by investigating their seed pods, bark, and other characteristics. Meet in the Conference House public parking lot at the end of Hylan Boulevard. Greetings. This is the New York Rare Bird Alert for Friday, February 15th 2013 at 8pm. The highlights of today's tape are TUFTED DUCK, HARLEQUIN DUCK, BARNACLE GOOSE, ROSS'S GOOSE, GREATER WHITE-FRONTED GOOSE, EURASIAN WIGEON, GRASSHOPPER SPARROW and LINCOLN'S SPARROW. As of Monday the drake TUFTED DUCK was back again on partly thawed Saint John's Pond in Cold Spring Harbor. This pond is adjacent to St. John's Church on the south side of Route 25A. The BARNACLE GOOSE was seen again Wednesday morning on Belmont Lake State Park and is presumably still feeding in the vicinity of St. Charles Cemetery where ever it can find suitable grazing. Another BARNACLE GOOSE was reported today with Canadas on Larchmont Reservoir in Westchester County. The ROSS'S GOOSE was present again this morning on Merritt's Pond north of Riverhead east of Roanoke Avenue. Two GREATER WHITE-FRONTED GEESE were noted a few times on the pond at the Heckscher Museum in Huntington at least to last Saturday. Six HARLEQUIN DUCKS present around the easternmost of the 3 ocean jetties off Point Lookout last Sunday were still in the same area through today though Sunday they were also noted flying over towards the Jones Beach West End jetty and today they flew west. Other interesting birds this week at Jones Beach West End have included small numbers of both RED and WHITE-WINGED CROSSBILLS through today and the LAPLAND LONGSPUR seen again Sunday and the HORNED LARK and SNOW BUNTING flock near the gazebo. After snowstorms areas where plows scrape up the dirt and grass along the edges of roadways can often be very productive in concentrating ground feeding birds and this was the case at the West End where such a scrape on the outer of the two turnarounds attracted a GRASSHOPPER SPARROW last Sunday this also joined by some IPSWICH SPARROWS and several other species. The GRASSHOPPER was still around Monday when an immature GLAUCOUS GULL visited the West End 2 parking lot. At least 4 AMERICAN OYSTERCATCHERS were with other shorebirds on the bar across from the Coast Guard Station Sunday and others were noted at Point Lookout. Six RAZORBILLS were in Jones Inlet today. A female type EURASIAN WIGEON was photographed off the Archery Range Road at Floyd Bennett Field last Sunday the same day finding a RAZORBILL again off Coney Island. A fairly tame immature ICELAND GULL has been on the Lake in Central Park from last Sunday at least through Thursday and other interesting reports from Central during the week have included WOOD DUCK, AMERICAN WOODCOCK, BALTIMORE ORIOLE, RUSTY BLACKBIRD and COMMON REDPOLL. Another interesting sparrow for the season was a LINCOLN'S SPARROW seen last Sunday at the Bayard Cutting Arboretum in East Islip. 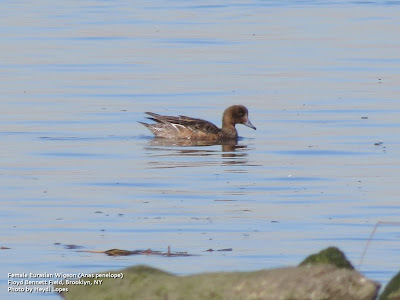 Thursday sightings on eastern Long Island included 2 HARLEQUIN DUCKS on the north side of Montauk Point, an immature ICELAND GULL at Shinnecock Inlet and lingering AMERICAN BITTERNS along Dune Road west of Shinnecock Inlet. COMMON REDPOLLS are popping up in some places recently and RED-NECKED GREBES were present off Pelham Bay Park and in Rye Westchester County recently. See Life Paulagics is hosting a pelagic trip from Freeport aboard the Captain Lou Fleet's Star Stream on Saturday March 2nd. This 12 hour trip leaving at 6am costs $185 per person. For reservations call Melissa Johnson of the Captain Lou Fleet at (516) 623-5823. Decent numbers of alcids have been further offshore recently. Since January 1st the amount of daylight hours in Brooklyn has increased from 9.1 hours to 10.5 hours. The increased amount of sunlight has, especially over the past 2 weeks, stimulated some of our local flora to begin their flowering cycle. 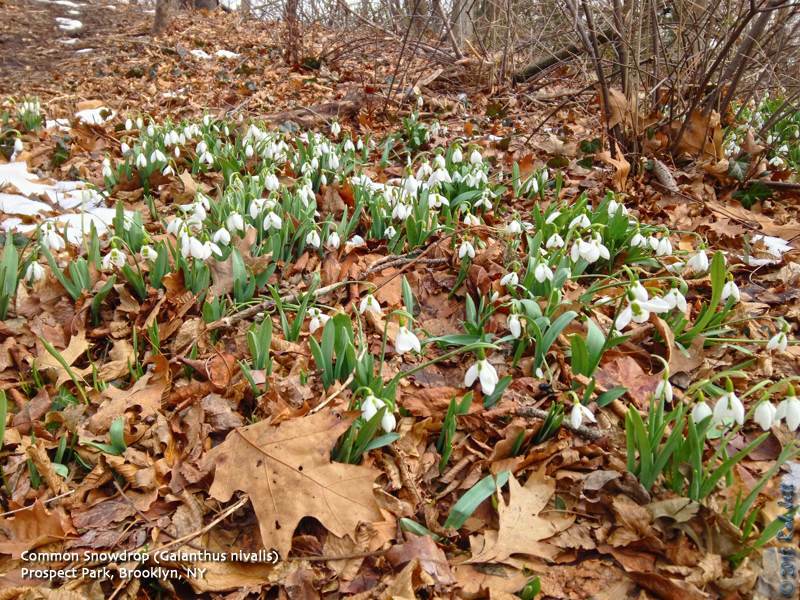 Common Snowdrops, one of the first wildflowers to emerge, are just now unfurling on sunbathed hillsides and fertile forests in Brooklyn's Prospect Park. It can sometimes even be seen pushing up through snow cover. This European species has become naturalized throughout North America. I was walking along the Nethermead Meadow footpath that parallels Center Drive when I inadvertently startled a Red-tailed Hawk on the ground. It was standing over a freshly killed squirrel. I didn't want to stress the raptor, so I headed to a tree several yards to the South. Using the tree as a blind, I watched as a second red-tail flew in, presumably to steal the squirrel away from the first hunter. The second hawk was noticeably larger than the first and the standoff ended quickly with the first surrendering the prey and flying up into a nearby tree. During this time the squirrel suddenly came to life and began to slink away. He didn't look very well, hopelessly stumbling, but seemed to be fighting to the end. As the gray mammal dragged himself towards the tree I was hiding behind, the hawk followed, attempting to land a kill shot with stabs from her razor-sharp talons. When the hawk spotted me peering out from behind the tree, she stopped, allowing the injured squirrel to escape up the trunk and into the safety of a cavity. I decided to cancel my Saturday Linnaean Society trip to Coney Island due to the forecast massive blizzard. As it turned out NYC didn't get hit with too much snow, although 60 mph wind gusts would have made birding along the coast futile. I opted to go to an afternoon movie with my wife and head over to Coney Island on Sunday. From there Heydi and I would do some more birding at the newly re-opened Floyd Bennett Field. It was a beautifully sunny day with most of the expected seasonal wildlife, culminating with one very nice find. When we arrived at Coney Island the tide was higher than I'd ever seen. The tide program that I use listed it at 5.91 feet, which would be the maximum for the year. The boulder jetty at the extreme Western end of the beach was nearly covered with water, with waves washing over much of its length. There are usually Purple Sandpipers foraging along the rocks at this spot. You can see from the photo that they would have had no protection from the waves on Sunday. Long-tailed Ducks were the most abundant waterfowl seen, with several hundred flying back and forth in the Lower Bay. The next most common duck was Red-breasted Merganser. We were hoping to located some scoters, or maybe, an uncommon Red-necked Grebe, but that was not to be. Hundreds of gulls foraged along the shore feeding along a line of mussels that had washed up from the storm. They were primarily Ring-billed Gulls with smaller numbers of herring and Great Black-backed Gulls. A Razorbill was diving near the end of the jetty closest to West 33rd Street. These relatives to the puffin are normally very rare Brooklyn visitors, but have been seen around the coast for most of this Winter. Previously they would have generated a lot of excitement among local birders. Now they are merely yesterday's news. After 90 minutes and 1.25 miles we slung our tripods over our shoulder's and walked North, to Coney Island Creek Park. The wind was blowing from the North-Northwest, so I expected that the conditions on Gravesend Bay would be colder and choppier than on the South side of the peninsula. Fortunately, though, it was actually fairly mild. There were lots of Common and Red-throated Loons, as well as, Horned Grebes on the bay. The annual large raft of scaup usually seen on the opposite side of the bay from us appeared to be MIA. Between a sanitation department facility and the marina at Bay 41st Street a Harbor Seal stuck his head out of the water and sniffed the air. He was probably disappointed with the "bouquet". We continued to walk East into Coney Island Creek. Within the creek and its assortment of sunken wooden barges were most of the usual suspects - Brant, Canada Goose, Mute Swan, Gadwall, American Wigeon, American Black Duck, Mallard, scaup, Bufflehead, Red-breasted Merganser, Ruddy Duck, Red-throated Loon, Horned Grebe, Ring-billed Gull, Herring Gull and Great Black-backed Gull. A single Common Goldeneye diving within a flock of Buffleheads was unusual for the creek. We spent about 15 minutes scanning all the gulls and eventually found something different. A Lesser Black-backed Gull was hanging around with several Herring Gulls. As the name suggests, he is superficially similar to the common Great Black-backed Gull, but significantly smaller. These birds are uncommon around NYC, but are regular Winter visitors around the coast. ...So we're standing on the shore of Jamaica Bay and I spot a small dabbling duck out of the water and walking on the sand. It looked sort of like a female American Wigeon, but something was not quite right. The main thing that stood out was that the head was a warm, brownish tone, not the gray with fine speckles I would expect on a female wigeon. The head was darker than the brown of the breast plumage. Our immediate thought was that it was a female Eurasian Wigeon. Heydi followed the bird with her camera, snapping off a bunch of shots. I used my phone to look online for identification information. 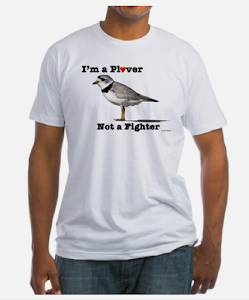 "Americans have pure white axillaries that contrast with gray underwing coverts. Eurasians show no contrast in the underwing, as the axillaries appear gray in the field. In the hand, it is clear that the axillaries of Eurasian Wigeon are white, covered with fine, silvery vermiculations. In bright sunlight the gray axillaries of Eurasian Wigeon can appear to be white." You can download the entire "Birding" article that compares female American and Eurasian Wigeons here. An article in the The Economist describes a company that has pioneered a way to use genetic testing to pinpoint the source of timber. Their hope is to try and slow illegal logging. SUPPOSE you want to buy a table. But you care about orang-utans, indigenous peoples and carbon emissions, so you don’t want it made with illegally harvested logs. Or suppose you run a chain of furniture shops, and you don’t want to go to jail for buying illegal timber. Either way, you face a snag: how to tell if a log is legal? Enter DoubleHelix Tracking Technologies, a Singapore-based firm that uses DNA testing to pinpoint where a piece of wood is from. “You can’t forge DNA,” says Andrew Lowe, its chief scientist. The firm sells its services to big retailers such as Lowe’s, B&Q and Marks & Spencer. John Simon, the boss of Simmonds Lumber, another DoubleHelix client, explains how it works. His firm, an Australian timber importer, used to rely on masses of paperwork when buying merbau, a pricey hardwood from Indonesia. Given the ease with which proof-of-origin papers can be faked, it was hard to tell where any of it really came from. Now, thanks to DoubleHelix, Simmonds can show that a piece of merbau decking assembled in Australia comes from a specific (and legit) stump in Indonesia. “We do it for both moral and business reasons,” says Mr Simon. Customers like to know that their decking is not destroying the planet. And company bosses want to stay out of trouble. Conservation laws are growing fiercer, especially in America, where businessfolk who break them may be jailed even if they did not know their wood was illegally sourced. DNA tests face two problems. One is the cost: testing $45,000-worth of merbau will set you back $250, says Jonathan Geach, the executive director of DoubleHelix. The second is that accurate global DNA maps exist only for about 20 species of tree, and the tests are no use unless you know what you are looking for. Neither problem seems insuperable, however. More species can be mapped, and the cost of testing will fall, as surely as a chainsawed tree. That’s bad news for the $30 billion-a-year illegal logging industry, but good for forests. February 18 & 19, 1 – 3 p.m.
February 18 – 19, 3 p.m.
Search for your favorite "backyard birds." Saturday, February 16, 2013, 10:00 a.m. to 2:00 p.m.
the LaTourette multi-purpose path (the bike path)—Meet in the Field of Dreams ballfield parking lot on Alaska Place off of Forest Hill Road, opposite Costco. We will walk along the path toward the T-junction removing alien saplings and cutting invasive vines that strangle native plants along the trail. After a two hour work session (our 198thmonthly workshop), we will take a short walk over nearby trails. Sunday, February 17, 2013, 4:00 p.m. to 5:30 p.m.
Come enjoy the park right before dusk and observe how nature settles in for the night. Let the sky soothe you with its purple hues. We’ll walk along the lake with stops for reflection. Meet at the Victory Blvd. entrance to Willowbrook Park at 4:00 p.m. sharp. Dress warmly. If it’s raining or snowing at the time of the walk, the event is postponed to Monday, February 18, same time. Join QBG staffer Shari Romar in this annual bird counting event. Greetings. 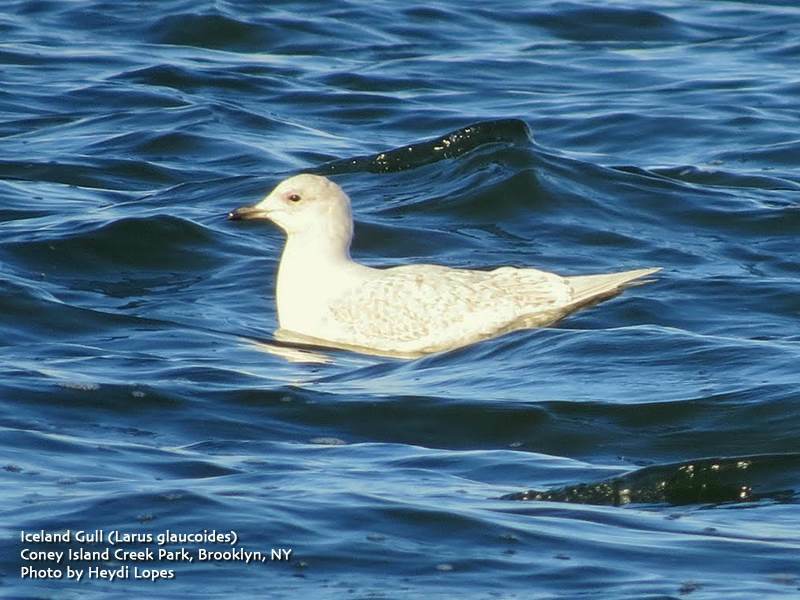 This is the New York Rare Bird Alert for Friday, February 8th 2013 at 7pm. The highlights of today's tape are YELLOW-HEADED BLACKBIRD, ROSS'S GOOSE, BARNACLE GOOSE, GREATER WHITE-FRONTED GOOSE, TUFTED DUCK, BARROW'S GOLDENEYE, DOVEKIE and BLACK-HEADED GULL but firstly some sad news. This past Tuesday Starr Saphir finally lost her long and courageous battle with cancer. Starr was a principle member of the New York City birding scene and treated many birders, novice and advanced alike, to the wonders of birding in the metropolitan area and a few weeks ago Long Island birder and long time friend Al Wollin also past away. Both will certainly be missed. Water related birds continue to be the main attraction regionally with the possible exception of the 2 to 3 YELLOW-HEADED BLACKBIRDS that have led birders on a merry chase around the Calverton area recently. The YELLOW-HEADEDS have been associating with large grackle, blackbird, cowbird flocks feeding in fields around Route 25 and adjoining roads. Once finding a flock look carefully as the birds move about in the fields. Some roads to try for the blackbird flocks include: along Route 25 north of Splish-Splash or Edwards Avenue, Manor Road or Twomey Avenue plus adjacent roads. A drake TUFTED DUCK continues to be seen occasionally on the pond at Blydenburgh Park south of Route 25 in Smithtown. A couple of ROSS'S GEESE have been present with Canadas lately one seen to Monday at Heckscher State Park is presumably the same individual spotted Wednesday on Westbrook Pond north of Heckscher and south of Route 27 off Main Street Route 27A. 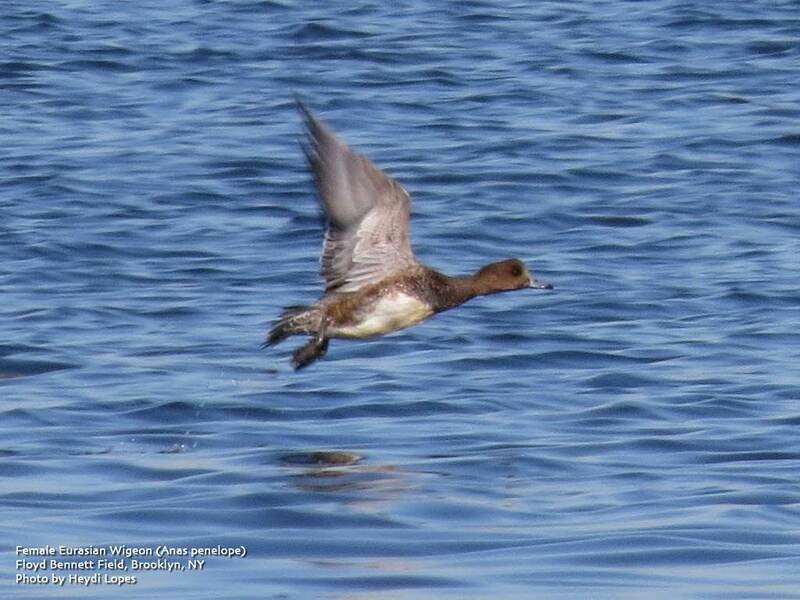 The second has been seen most frequently on Merritts Pond north of Riverhead but has also wandered north to the fields around Doctor's Path near Sound Avenue. Single BARNACLE and GREATER WHITE-FRONTED GEESE continue in the Belmont Lake State Park to St. Charles Cemetery area sometimes seen north of St. Charles at Pine Lawn Cemetery or the private Colonial Springs Golf Course. The pair of BARROW'S GOLDENEYES continues with Commons at the south end of Lake Montauk as viewed from South Lake Drive or other vantage points. The immature BLACK-HEADED GULL and sometimes also an adult Black-headed can be seen at the same location. Finishing up the Montauk area some RAZORBILLS continue at the point, 2 ICELAND GULLS remain along the beach west of the Montauk Harbor Inlet and up to 40 WHITE-WINGED CROSSBILLS have continued to visit the pines at Kirk Park on the western end of the town of Montauk. The adult LESSER BLACK-BACKED GULL continues at the end of Lazy Point Road in Napeague and if there look for the SNOWY OWL occasionally seen on Hick's Island across the channel. AMERICAN BITTERNS remain along Dune Road west of Shinnecock Inlet. Up to 6 EURASIAN WIGEONS have gathered recently on the west of Sayville Golf Course. In the city area Central Park reservoir has hosted ICELAND GULL recently. BARRED OWL continues in the park and at other local sites and a COMMON REDPOLL was at the Ramble feeders on Wednesday. Six WHITE-WINGED CROSSBILLS were in Prospect Park in Brooklyn Wednesday with 8 plus a COMMON RAVEN at Green-wood Cemetery last Sunday. A RAZORBILL was in Dead Horse Bay in Brooklyn last Saturday and single DOVEKIE and RAZORBILL were reported off Beach 24th Street in the Rockaways Thursday. AMERICAN BITTERN was still at Brooklyn's Marine Park Nature Center last Sunday. 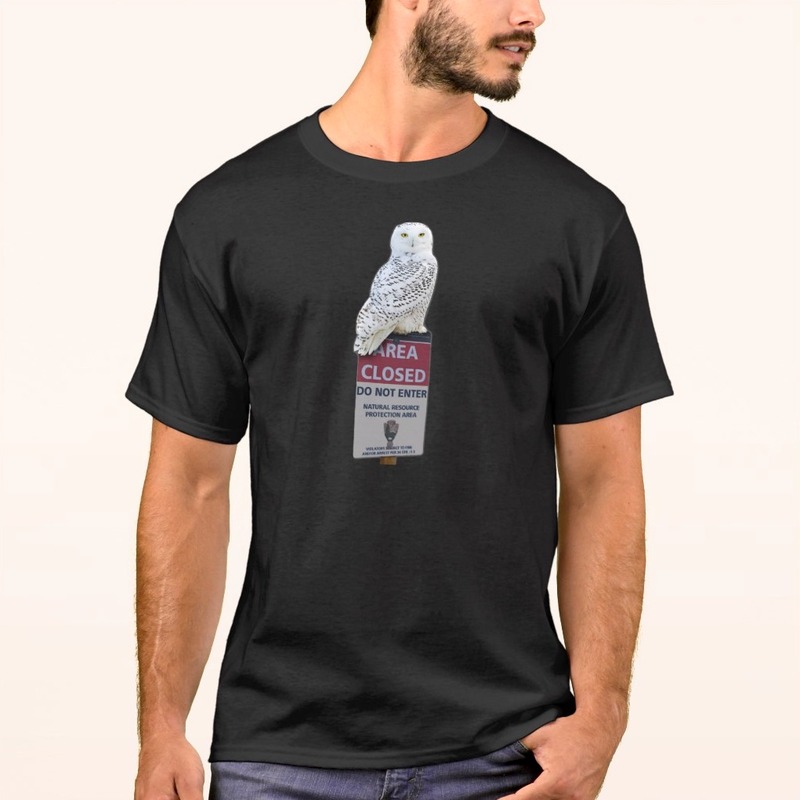 A LAPLAND LONGSPUR has been seen again at Jones Beach West End and a SNOWY OWL was present at that area through last weekend. White-winged Crossbills are still being seen around Brooklyn and the rest of New York City. Sweetgum seeds appear to be their main source of food. As the season progresses the sweetgum trees have begun dropping the seed-bearing balls and these Winter finches are forced to forage for the seeds on the ground. The experience that sparked my interest in birds and birdwatching was seeing my first urban Red-tailed Hawk. It was a fairly random sighting. My wife and I were taking a walk in Brooklyn's Prospect Park when I noticed a large bird of prey perched low and out in the open in a deciduous tree. As we were watching it a noisy flock of crows arrived on the scene and attempted to chase the raptor away. I soon learned that this is called "mobbing" behavior, pretty typical of crows when they encounter a potential threat. From that point on, whenever I went in search of our local hawks, I found that listening for crows usually made quick work of it. Crows, who are members of the family corvidae, are generally considered by biologist to be highly intelligent animals. When mobbing a raptor, they work cooperatively with each individual taking a turn diving at the interloper while the rest of the "murder" stands by as backup. During my early days of birding in Brooklyn, American Crow populations around the city dropped off considerably due to the effects of West Nile Virus. That means there is a lot less harassing of the local Red-tailed Hawks. I'm not a scientist, but I'd imagine that the decline in crows have contributed to the breeding success of our city hawks. There are now multiple nesting pairs in each of the boroughs. This brings me to the point of this posting and a potential turn in the lives of our local Red-tailed Hawks. "The raven is thought to have been widely distributed over the state before the virgin forest was eliminated, but it had become very scarce in the 19th century, and Eaton (1914) reported it restricted, in constantly diminishing numbers, to the Western Adirondack region." Their numbers appear to be rebounding, however, and not just in rural areas. For several years a pair has successfully nested in Queens, not far from Forest Park. 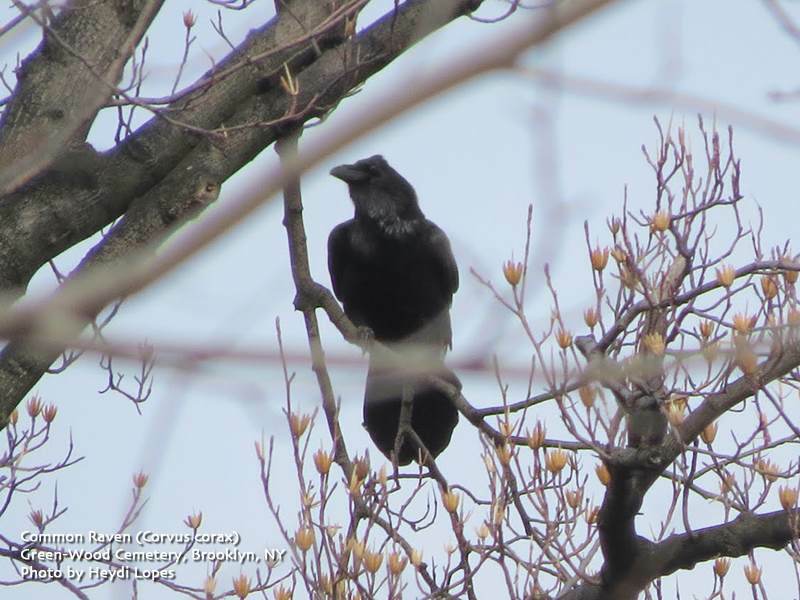 With three recent confirmed sightings of raven in Prospect Park and Green-Wood Cemetery, last weekend Heydi and I went in search of one. We headed to Green-Wood. We walked the ridges and valleys of Green-Wood for nearly 2 hours without hearing even a distant "croak" from this huge corvid. We did manage to locate a small flock of White-winged Crossbills and several other winter songbirds, but nothing out of the ordinary. When it was time for me to head home I decided to follow Dell Avenue down into Forest Dell. The path there is lined with sweetgum trees and a nice mix of songbirds were feeding on the spilled seeds below the trees. Dell Avenue is a long, gradual decline with steep ridges on either side. We were nearly at the bottom of the road when I heard the deep, croaking "cr-r-ruck, cr-r-ruck" of a raven. It sounded like it was coming from the south-west, near Cedar Dell. Heydi and I bolted up a steep ridge and ran towards Cedar Dell. The sound had stopped. We scanned the trees at the opposite side of the small glen for a few moments, then I saw a huge, black bird fly a short distance from a conifer on Walnut Hill into a tuliptree. He made a deep croaking sound. Right behind him was a Red-tailed Hawk in hot pursuit. Ravens are opportunistic animals. They will eat just about anything. I have no idea if they ever prey on young Red-tailed Hawks, but to see our urban top-of-the-foodchain creature suddenly threatened by another bird gave me pause. I've seen red-tails fighting with Great Horned Owls over a nest site, but for the most part the owl and hawk usually just ignore each other. Our cemetery Red-tailed Hawk clearly did not want this raven in the neighborhood. As we watched, a second, immature Red-tailed Hawk joined in the fight. The two hawks chased the raven back and forth between the trees at Cedar Dell and Walnut Hill. After a few minutes the hawks prevailed and the raven mumbled a few words before disappearing in the direction of 20th Street. 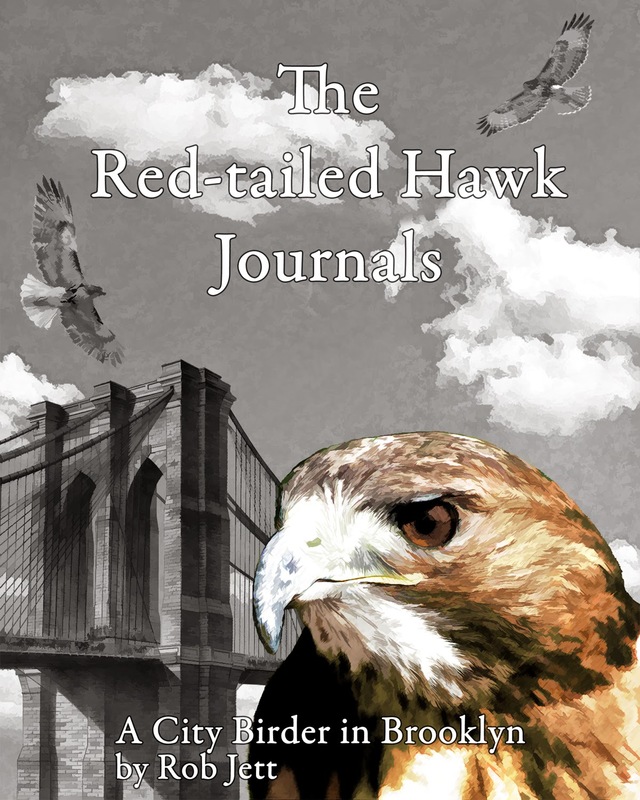 For a short time, the tables had been turned on the Red-tailed Hawks. Where they are normally the top predator being periodically hounded by crows, they seemed to be instinctively intimidated by the raven. I use the word "instinctively" because I'm guessing that most of our born and raised NYC Red-tailed Hawks have never crossed paths with a raven. It will be interesting to see how this situation evolves, especially if the ravens end up nesting near the cemetery. The great thing about birding on January 1st is that every bird you see or hear is new. Mallard? Put it on your list. Rock Pigeon? On the list. House Sparrow? Well, you get the idea. With this Winter's irruption of northern birds winding down, I was determined to track down as many of said species as possible on the first of the year. It was important to get them on my 2013 list now as there's no telling if any would be heading into our area come December. For the second year in a row, Robin and I took the train down to Coney Island on New Year's Day. Unlike New Year's Day 2012's tropical conditions, it was appropriately blustery and the crowds waiting for the traditional Polar Bear Club plunge into the surf was much smaller. It's a fun atmosphere and I highly recommend attending ... although I'm not too sure about the swimming part of the activities. Anyway, a slow walk down to the Western-most jetty gave me my first 20 birds of the New Year. The biggest surprise being a pair of Black Skimmers still hanging around the area. After Coney Island I decided to head into Prospect Park to try and locate some crossbills, owls and pick-up as many of the overwintering songbirds and waterfowl as possible. 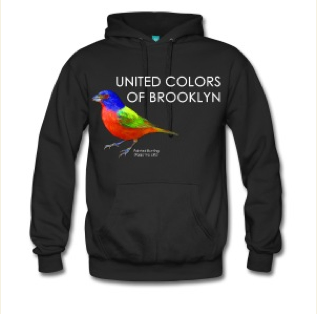 Heydi had begun her year birding around Gerritsen Creek in Marine Park and would be meeting me at Prospect Park. After Prospect Park we'd walk over to Green-Wood Cemetery. 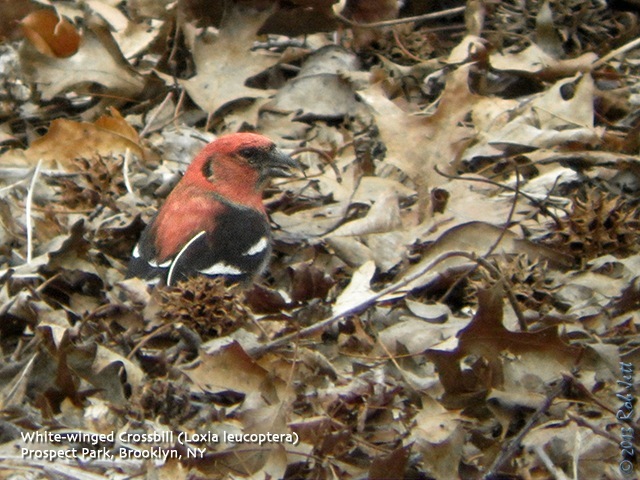 Two hours of birding in Prospect Park added 35 more species to my year list, but most important, included White-winged Crossbills. Another good bird seen was American Pipit, which I had a hard time finding in 2012. A couple of small flocks of these nondescript little brown birds were feeding in the grass on the Long Meadow. Ninety minutes at Green-Wood Cemetery turned up Common Redpoll and a few other, much more common species. By the end of the day I had racked up 63 species, a new January 1st high for me. Later in the month I would add Common Merganser and Yellow-breasted Chat in Prospect Park, Iceland Gull at Coney Island Creek Park, Razorbill at Coney Island Beach and Canvasback at Dead Horse Bay. Certainly the highlight of the month would be finding a Thick-billed Murre at Dead Horse Bay. I wrote about that experience here.